The key to most of Ben Green’s stories is meeting a stranger on the way to or from somewhere new and strange. 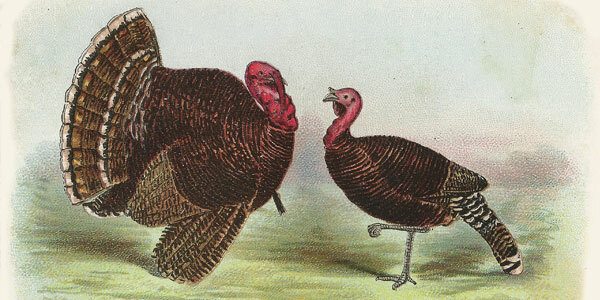 Is this a friend, an adversary, a rival in an elaborate charade? 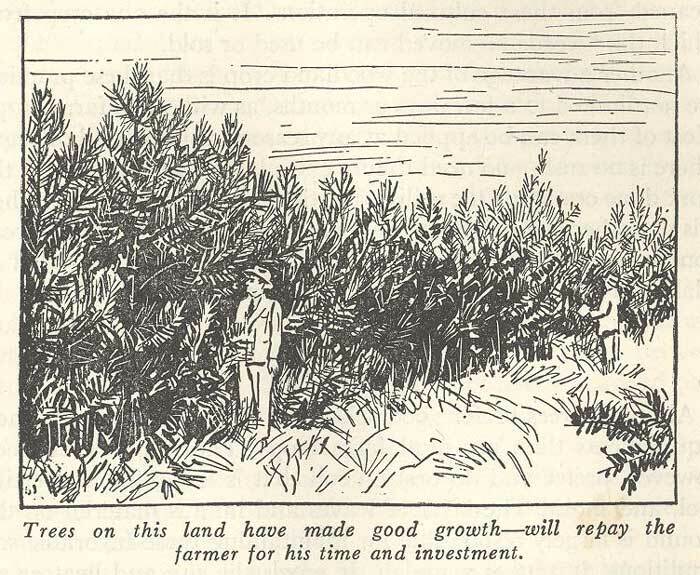 A farmer down on his luck, or a fellow trader addicted to the thrills and rewards of sharp practice? 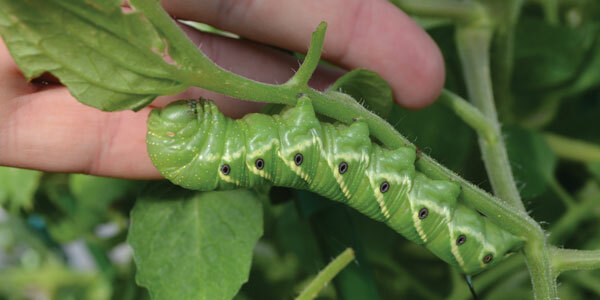 Green has the knack of traveling incognito, of gaining valuable information by sharing meals and swapping favors. Burnout is common to idealists who invest deeply in their dreams. It is easy to overreach, and promise more than you have to give. Then too there is that tempered hidden anchor called hope, the mountain climber’s friend driven into cracks to belay and secure him as he goes, which still may fail first or last. So following the story that underlies these essays it is not hard to see how, as Kingsnorth says, finding himself increasingly mired in endless meetings with corporate spokesmen paid to resist him, enough futile effort might lead to despair. 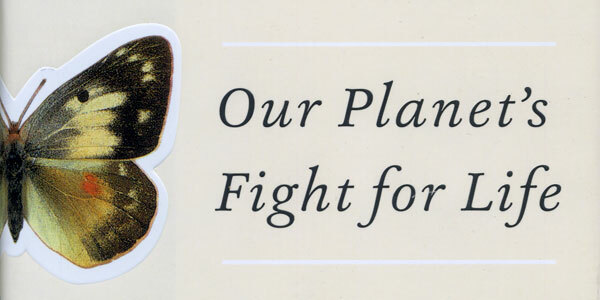 SFJ Spring 2016 Preview: Edward O. Wilson’s new book, Half-Earth: Our Planet’s Fight for Life, offers a plan for the problem of species extinction: the dominant species, man, must hold itself back, must relinquish half the earth’s surface to those endangered. It is a challenging and on the face of it improbable thought, expressed in a terse style. But his phrases are packed because the hour is late. 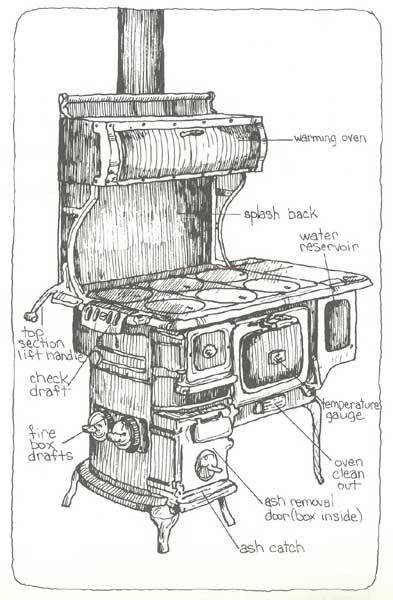 Illustrated guide to the wood stove and it’s accoutrements. 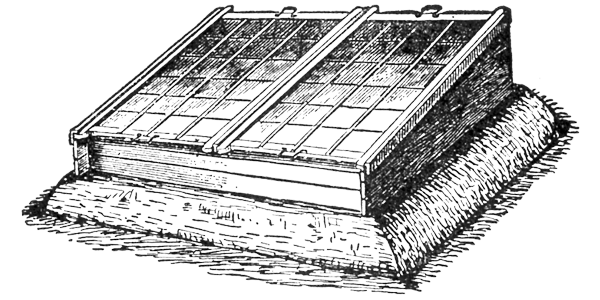 Mixed with sand, water, and straw, a clayey-subsoil will dry into a very hard and durable material; indeed, it was the first, natural “concrete”. In the Americas, we call it “adobe”, which is originally from the Arabic “al-toba”, meaning “the brick.” Invading Moors brought the word to Spain from North Africa, where an ancient mud building tradition continues today. 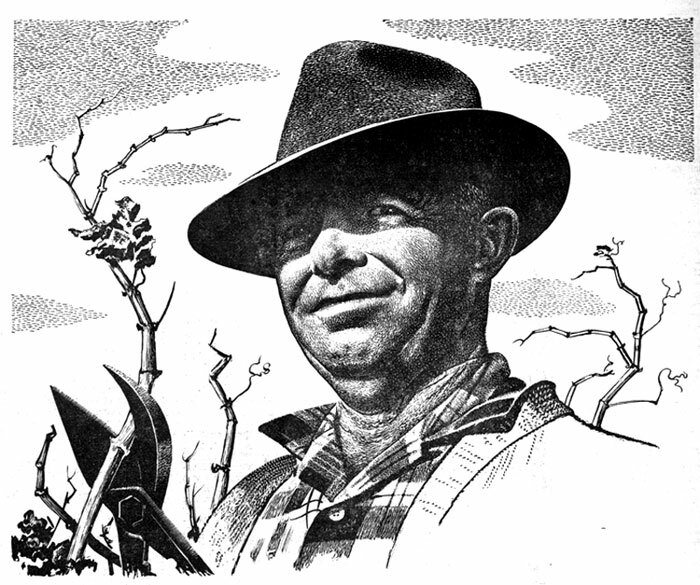 From Dusty Shelves: A World War II era article on grassland farming. 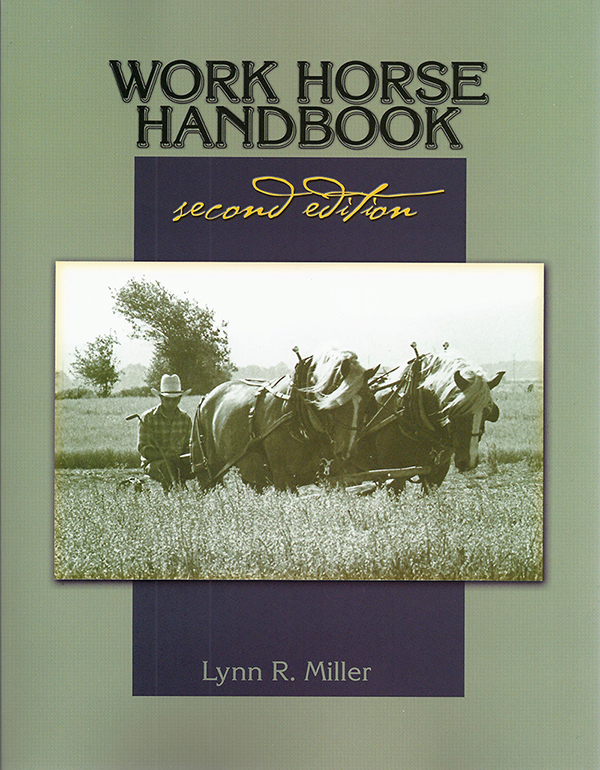 Over 40 years Lynn Miller has written a whole library of valuable and indispensable books about the craft of working horses. 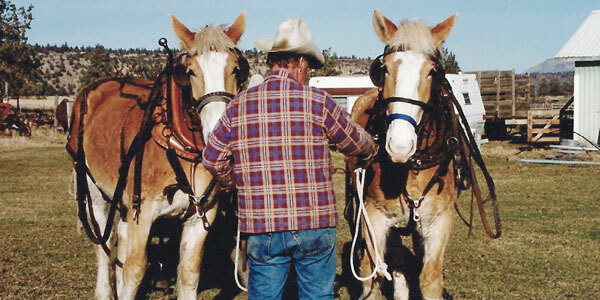 He has helped beginners acquire the basics of harnessing and working around horses, and has led those further along to focus on the specific demands of plowing, mowing, haying and related subjects. 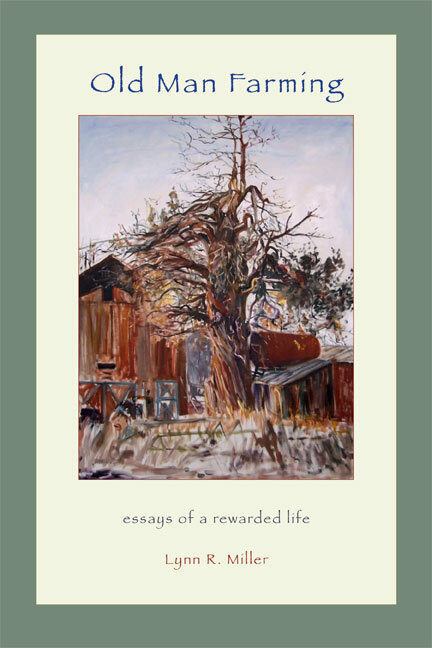 But, in a fitting culmination, his latest book, The Art of Working Horses, raises its sights and openly ponders secrets at the heart of the work that may over time elevate it to an art. 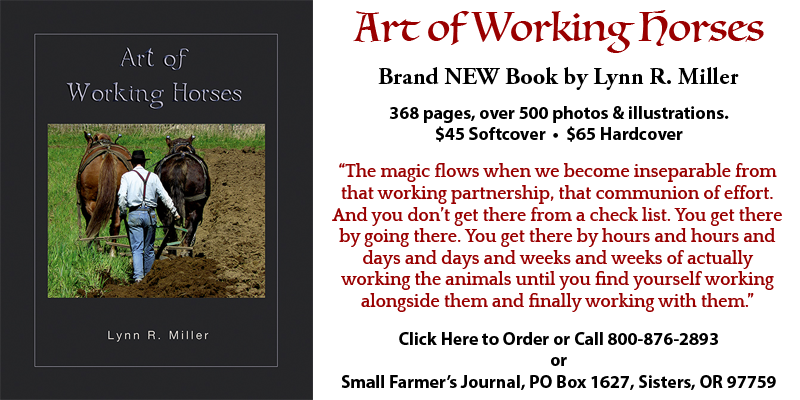 One could loosely say this is a “how-to” book but it is more of an “existential” how-to: how to get yourself into a way of thinking about the world of working horses. 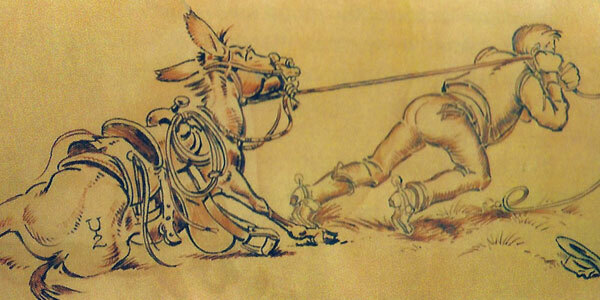 Maybe we need to explain what a working horse is. 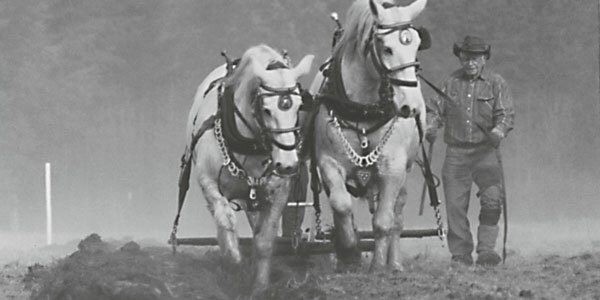 A working horse is one, in harness, given to a specific task. 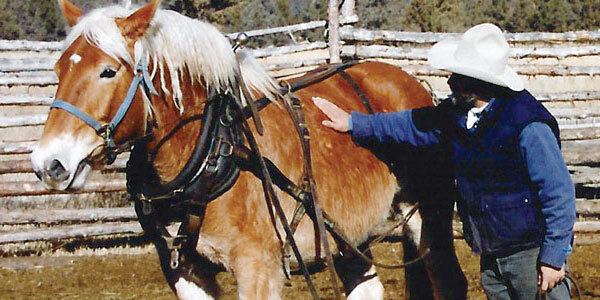 So, in that context, the book illustrates the many ways Miller has worked with his equine partners over the years – helping them understand what he wants them to do, as both work together to create relationships that help achieve desired goals. 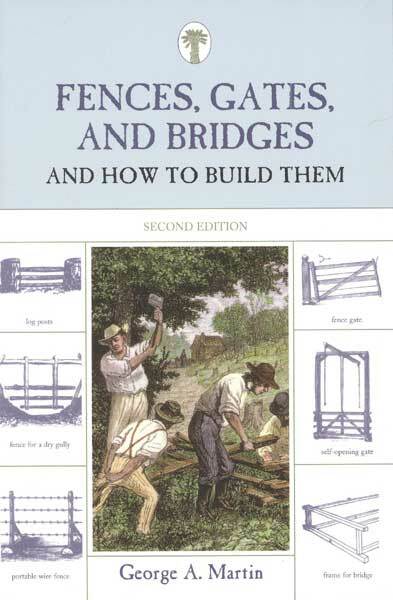 Book Excerpt: The invention of barb wire was the most important event in the solution of the fence problem. 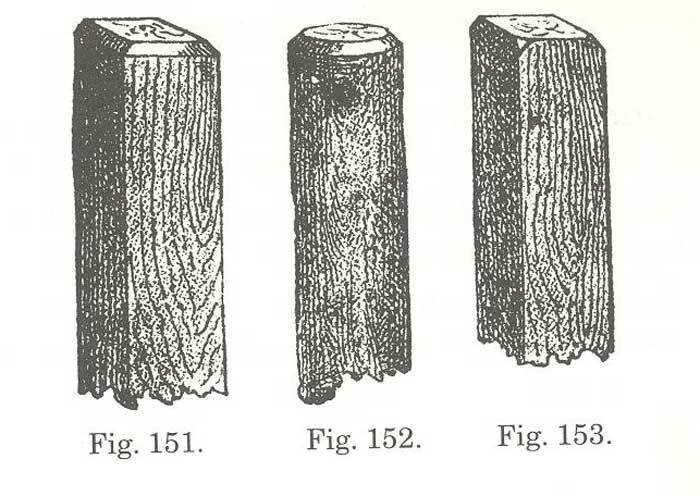 The question of providing fencing material had become serious, even in the timbered portions of the country, while the great prairie region was almost wholly without resource, save the slow and expensive process of hedging. At this juncture came barb wire, which was at once seen to make a cheap, effective, and durable fence, rapidly built and easily moved. 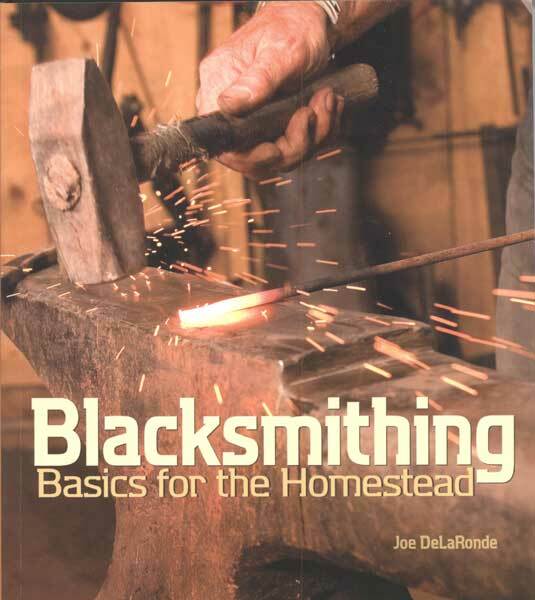 Illustrated guide to basic blacksmithing techniques, an excerpt from Blacksmithing: Basics For The Homestead. 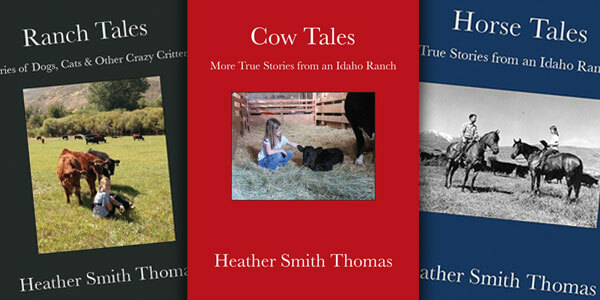 Lynn briefly reviews several books, including Joe De Yong, A Life in the West by William Reynolds; Storey’s Guide to Raising Beef Cattle 4th Edition by Heather Smith Thomas; and the Farm Collector Show Directory. 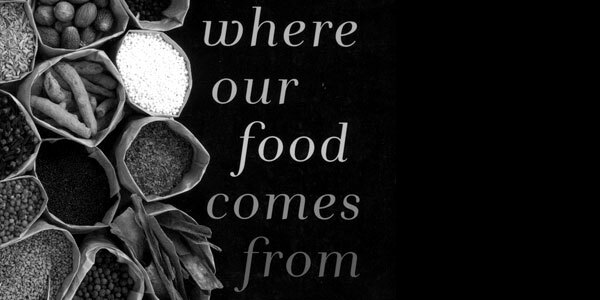 Gary Paul Nabhan’s book “WHERE OUR FOOD COMES FROM: Retracing Nikolay Vavilov’s Quest to End Famine” (Island Press, 2009) is a weighty tome, freighted with implications. But as befits its subject it is also portable and travels well, a deft exploration of two trips around the world, that of the author following in the footsteps of a long-gone mentor he never met, the Russian pioneer botanist and geneticist Nikolay Vavilov (1887-1943). 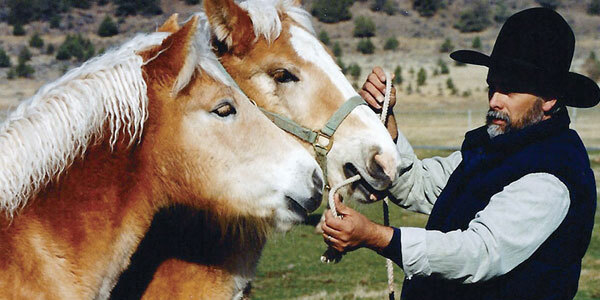 It is difficult to accurately measure a horse’s neck without fitting. 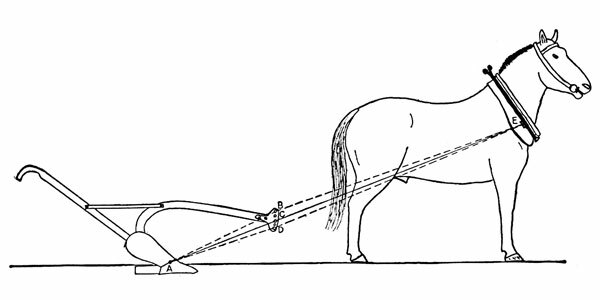 In other words, there are so many variables involved in the shape and size of a horse’s neck that the only accurate and easy way to size the neck is to use several collars and put them on one at a time until fitting is found. Where the soil is soft, loose, and free from stone, posts may be driven more easily and firmly than if set in holes dug for the purpose. 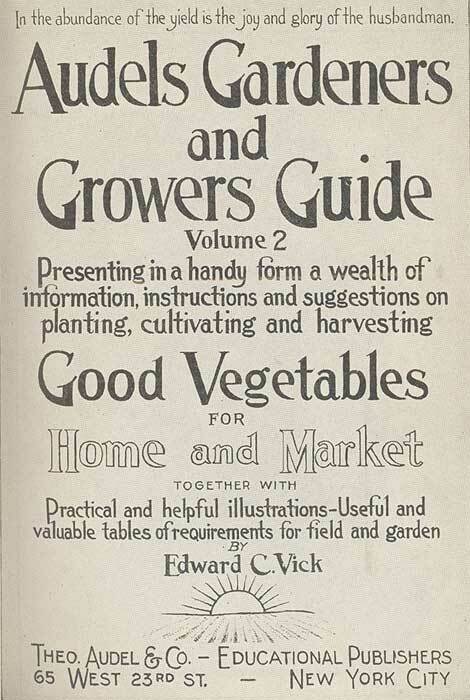 From humor-filled stories of a life of farming to incisive examinations of food safety, from magical moments of the re-enchantment of agriculture to the benches we would use for the sharpening of our tools, Farmer Pirates & Dancing Cows offers a full meal of thought and reflection. 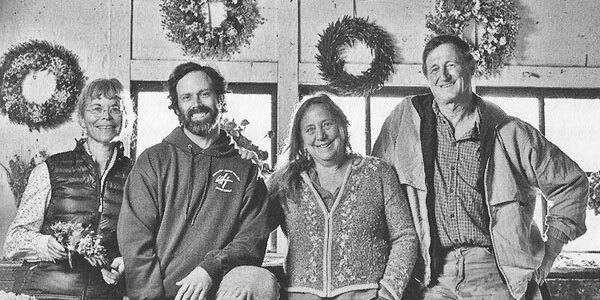 Farming as a vocation is more of a way of living than of making a living. Farming at its best is an Art, at its worst it is an industry. 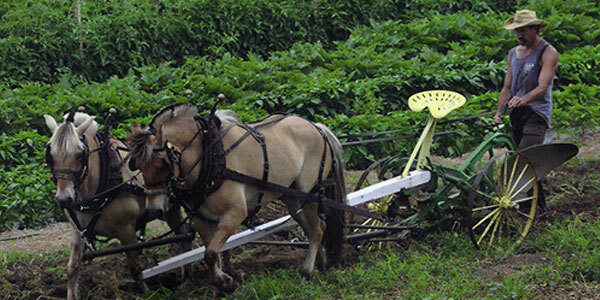 Farming can be an Art because it allows at every juncture for the farmer to create form from his or her vision. 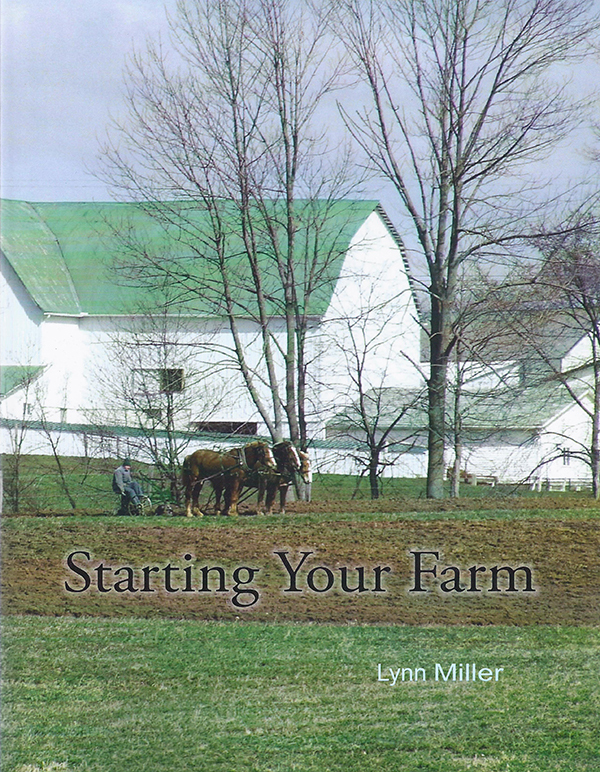 If the reader is considering the construction of a barn we encourage you to give more than passing thought to allowing the structure of the gable to be open enough to accommodate the hanging of a trolley track. 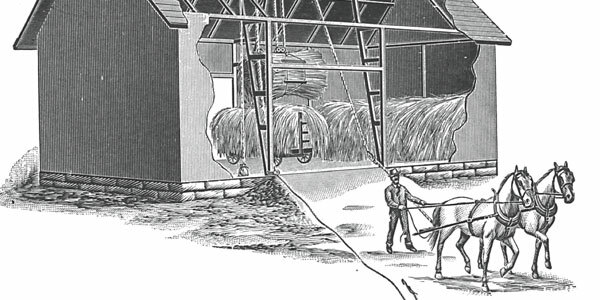 It is difficult or impossible to retrofit a truss-built barn, which may have many supports crisscrossing the inside gable, to receive hay jags. At least allowing for the option in a new construction design will leave the option for loose hay systems in the future. 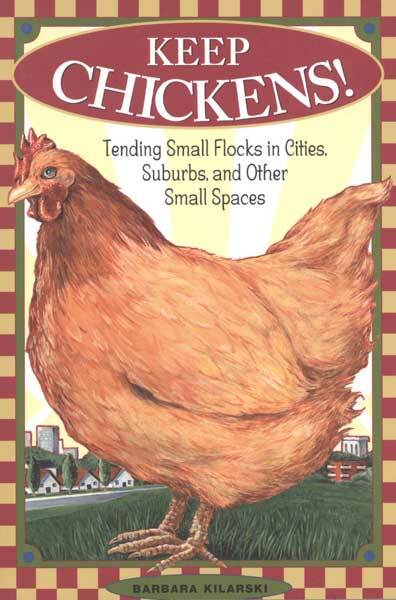 In this era when everyone seems focused on the growth of our cities we know that our readership is still heartily invested in our rural landscape. 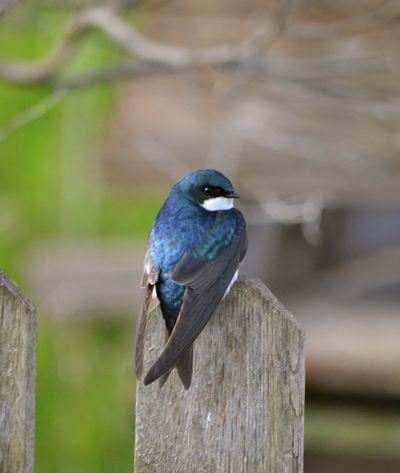 The people Smarsh writes about are our neighbors, and maybe even ourselves. 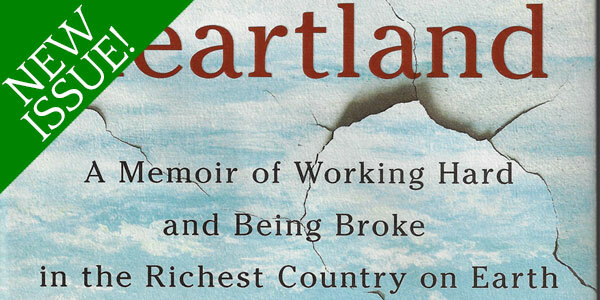 Heartland is touted as a memoir but it is a life study, an ethnography if you will, of farm-based families that struggle to get by. When hitching to the mower, first make sure it’s on level ground and out of gear. 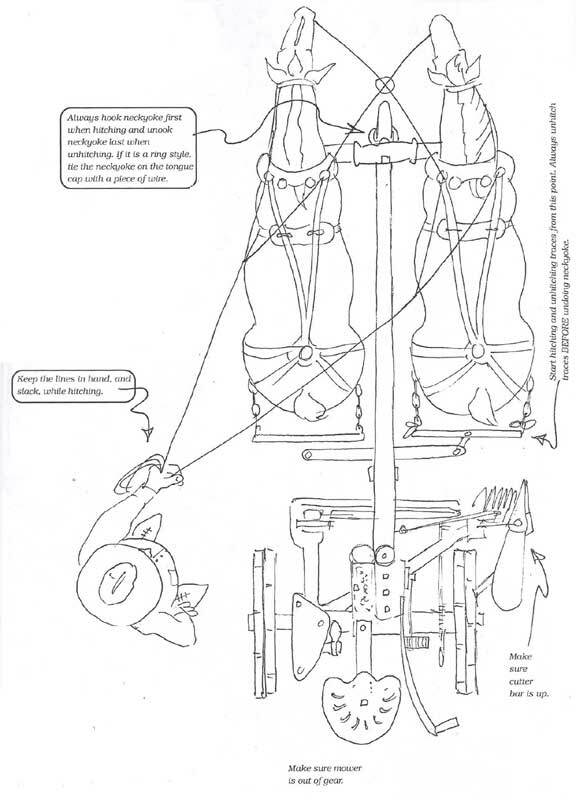 The cutter bar should be fastened up in the vertical or carrier position. This is for safety of all people in attendance during hitching. I believe that there exist many great practicing teachers, some of who deliberately set out to become one and others who may have never graduated from college but are none-the-less excellent and capable teachers. I would hazard a guess that many readers of Small Farmer’s Journal know more than one teacher who falls within this latter category. 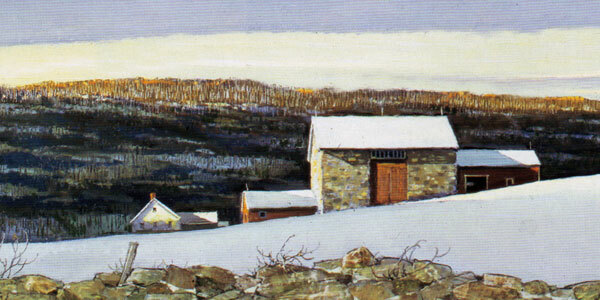 My grandfather, and artist and author Eric Sloane, were two such teachers. 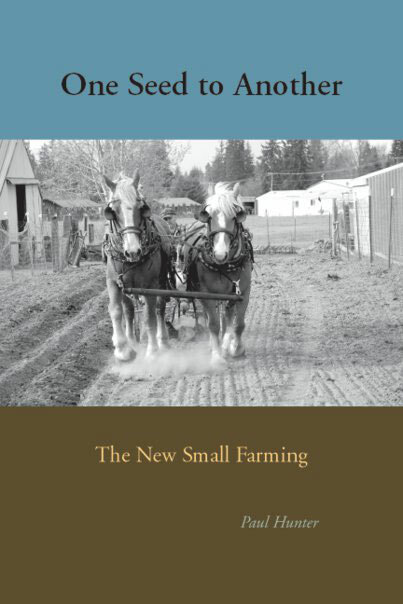 Book Review – The New Horse-Powered Farm by Stephen Leslie: Working with horses is not something you can learn exclusively through watching DVD training videos and attending workshops and seminars. These things and experiences can be very useful as auxiliary aids to our training, but they cannot replace the value of a long-term relationship with a skilled mentor. You are probably thinking why would I want to dry up a doe? If the plan is to rebreed the doe, then she will need time to rebuild her stamina. Milk production takes energy. Kid production takes energy, too. 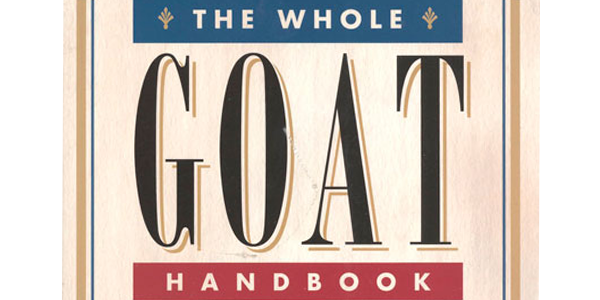 If the plan is to have a fresh goat in March, then toward the end of October start to dry her up. The first thing to do is cut back on her grain. 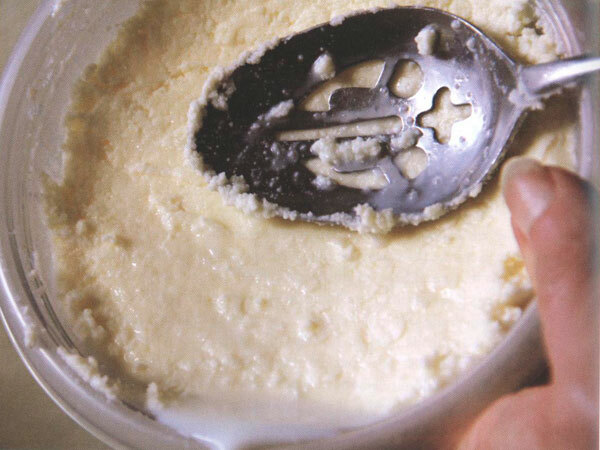 Grain fuels milk production. 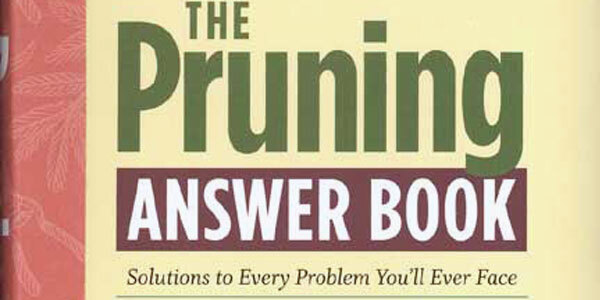 This guide to hedge-trimming comes from The Pruning Answer Book by Lewis Hill and Penelope O’Sullivan. 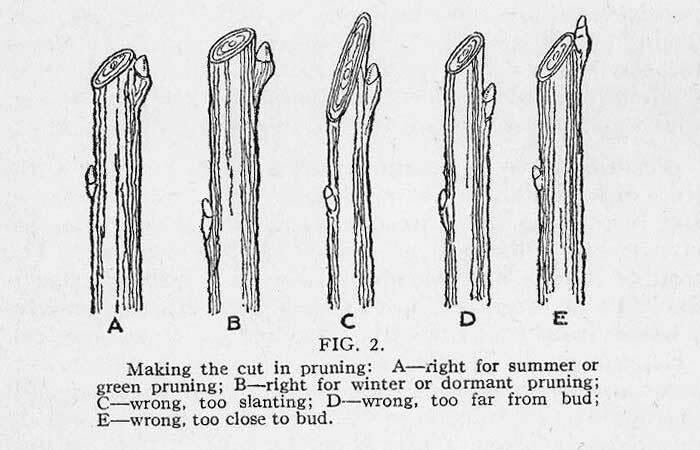 Q: What’s the correct way to shear a formal hedge? 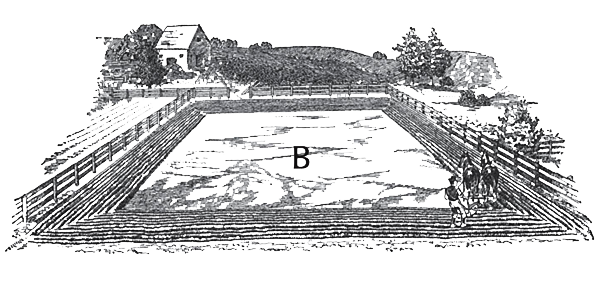 A: The amount of shearing depends upon the specific plant and whether the hedge is formal or informal. You’ll need to trim an informal hedge only once or twice a year, although more vigorous growers, such as privet and ninebark, may need additional clippings. 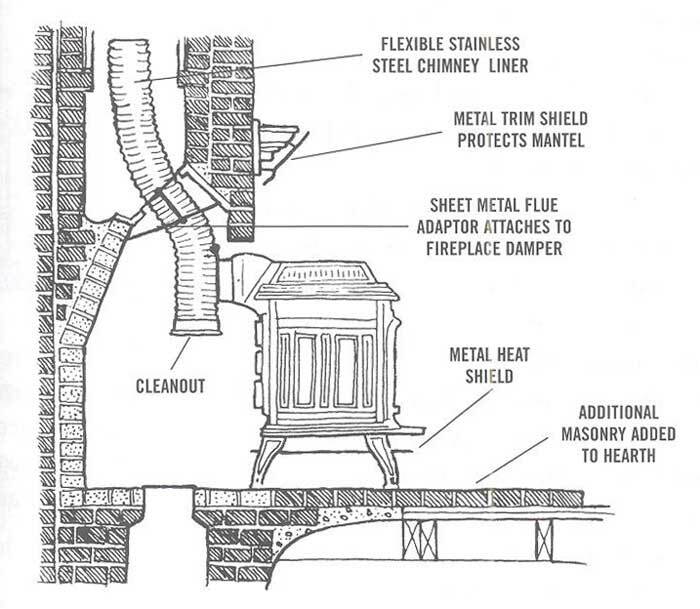 Because the venting requirements for a wood stove are different than for a fireplace you need to retrofit a stainless steel chimney liner. 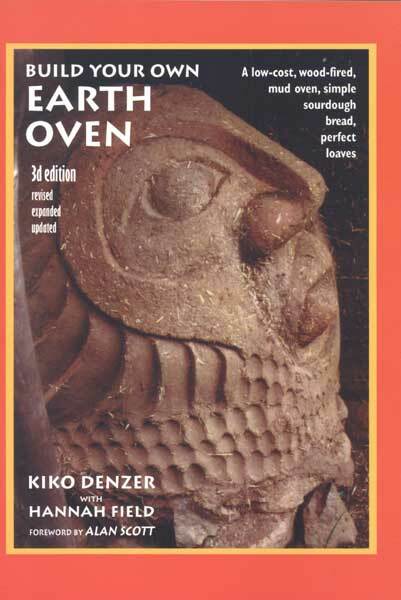 A liner provides the draft necessary to ensure that the stove will operate safely and efficiently. When you introduce new animals to an established herd or flock, you should observe your dog’s reactions and behavior for a few days. Since he will be curious anyway, it is a good idea to introduce him to the new animals while he is leashed or to place the new animals in a nearby area. 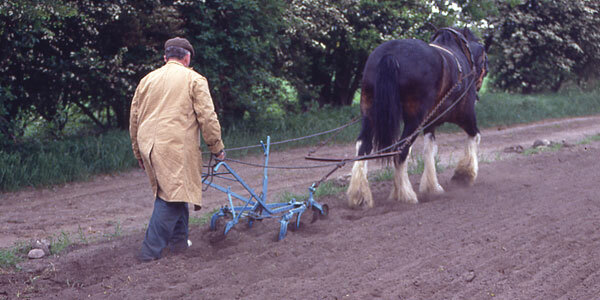 There are four general plans, or methods of plowing fields. 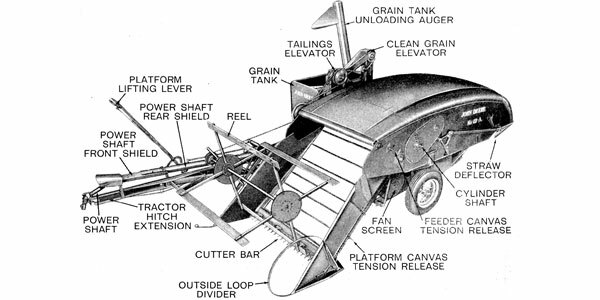 These are: (1) to plow from one side of a field to the other; (2) to plow around the field; (3) to plow a field in lands; and (4) to start the plowing in the center of the field. 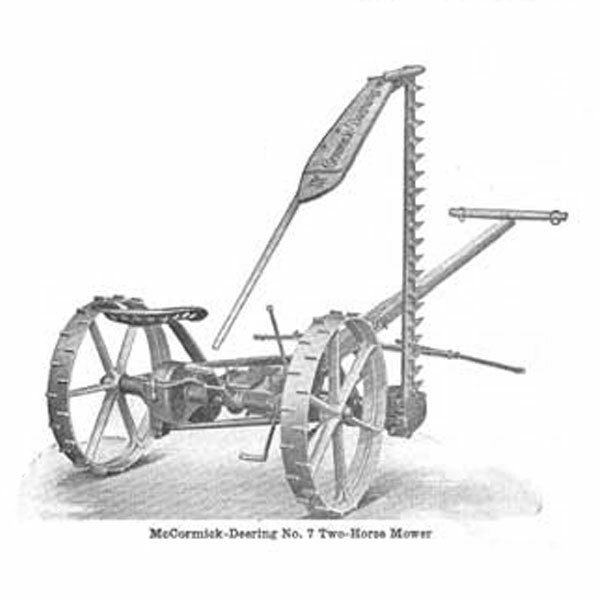 McCormick Deering/International’s first enclosed gear model was the No. 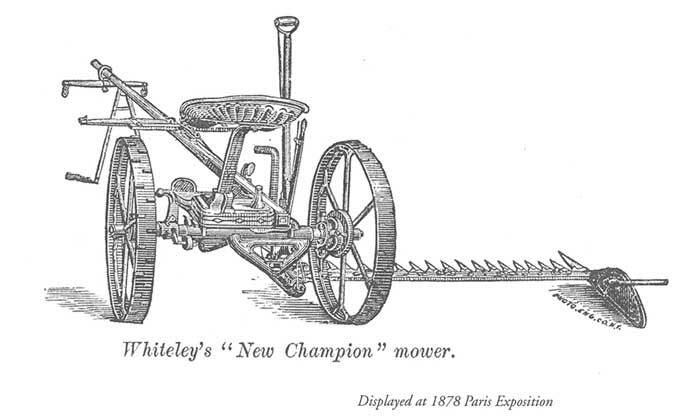 7, an extremely successful and highly popular mower of excellent design. Long after his physical capacities have dwindled to pain and stiffening, what drives the solitary old man to continue bringing in the handful of Guernsey cows to milk? One Seed to Another is staggering and bracing in its truths and relevance. This is straight talk from a man whose every breath is poetry and whose heartbeat is directly plugged into farming as right livelihood. 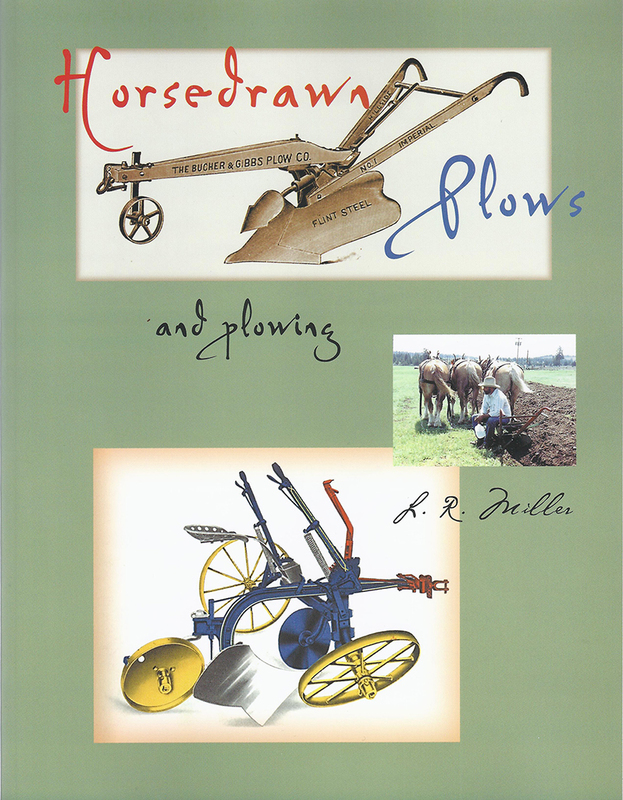 All other aspects being equal, the primary difference in plowing, comfortably, with a single horse is that the animal walks on unplowed ground immediately adjacent to the previous furrow, rather than in the furrow. 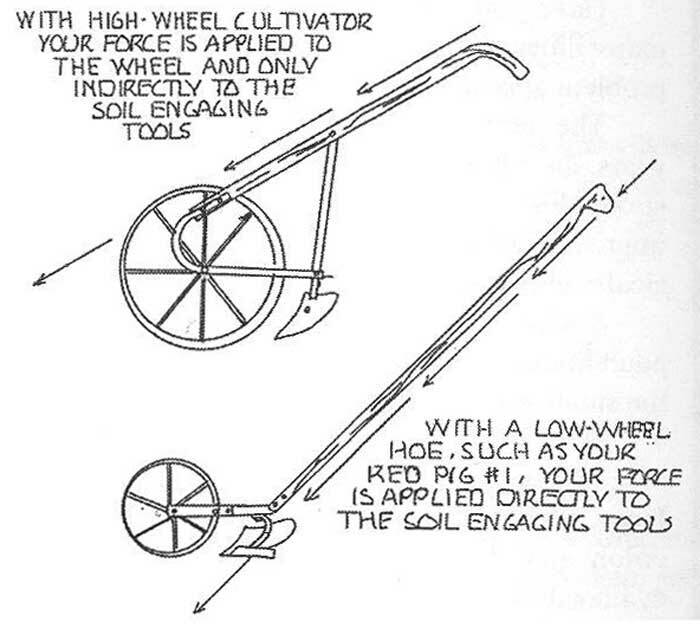 This will cause the point of draft at the shoulder to be somewhat higher and will dictate hitching longer and/or higher than with the animal walking down 5 to 8 inches lower in the furrow. 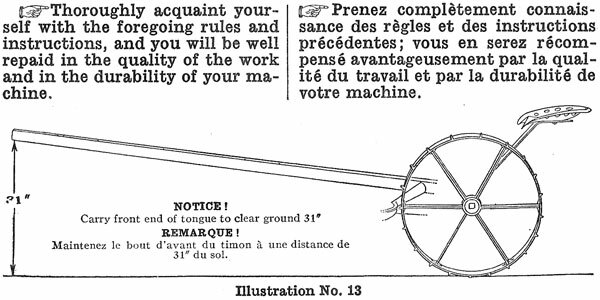 How to remove the wheels of a No. 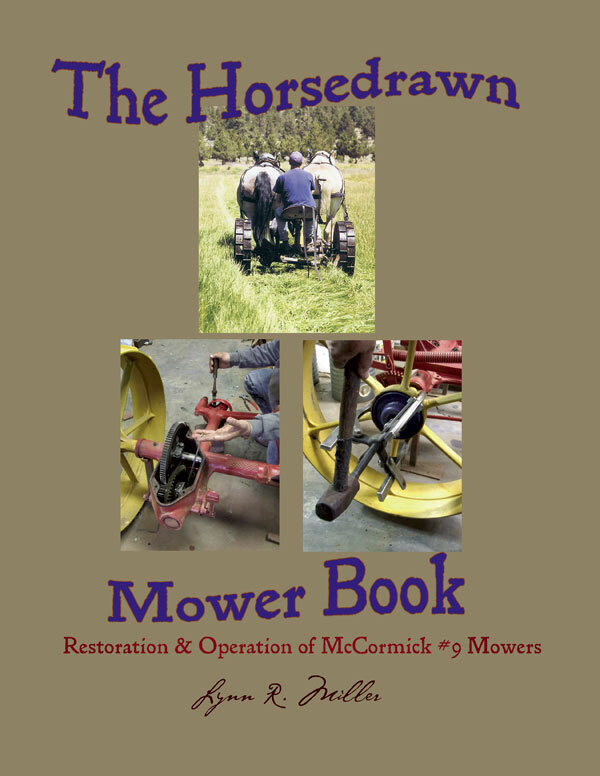 9 McCormick Deering Mower, an excerpt from The Horsedrawn Mower Book. 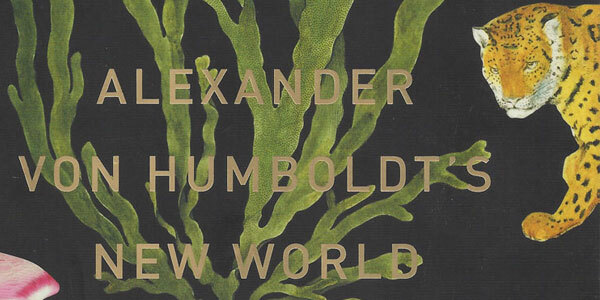 Somewhere amid the ebbs and eddies of a curious childhood I wondered who Alexander von Humboldt might be. I had noticed all the places named for him, sprinkled on maps of the world, and assumed he was some kind of explorer. It was not till I took up sailing in my late twenties that I learned of the Humboldt Current, a cold nutrient-rich Pacific current known to fishermen from time immemorial, that runs up the coast of South America from Chile to Peru, Ecuador and Columbia. 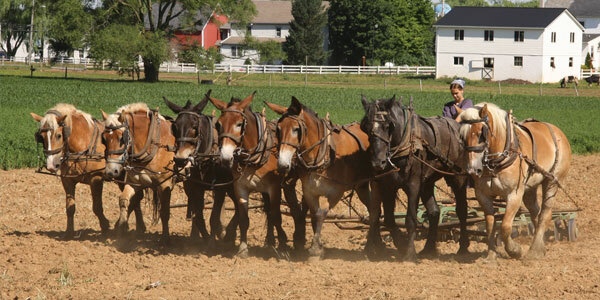 Here is a peek into the pages of Horsedrawn Plows and Plowing, written by SFJ editor and publisher Lynn R. Miller. You die off by passing away. You live on by passing on. I want to pass the culture of my life on slowly, over the ripening time of my best years. 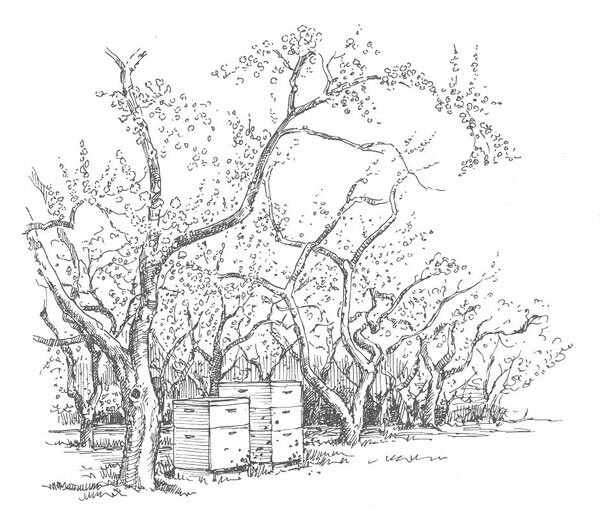 It is well known that the value of pollination and its resultant seed set and fruit formation outweigh any provided by honey bee products like honey and beeswax. What kind of milk animal would best suit your needs? 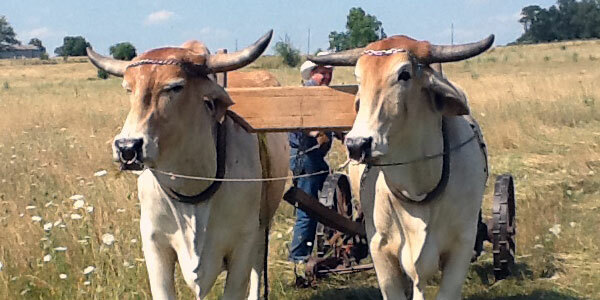 For barnyard matchmaking to be a success, you need to address several concerns. 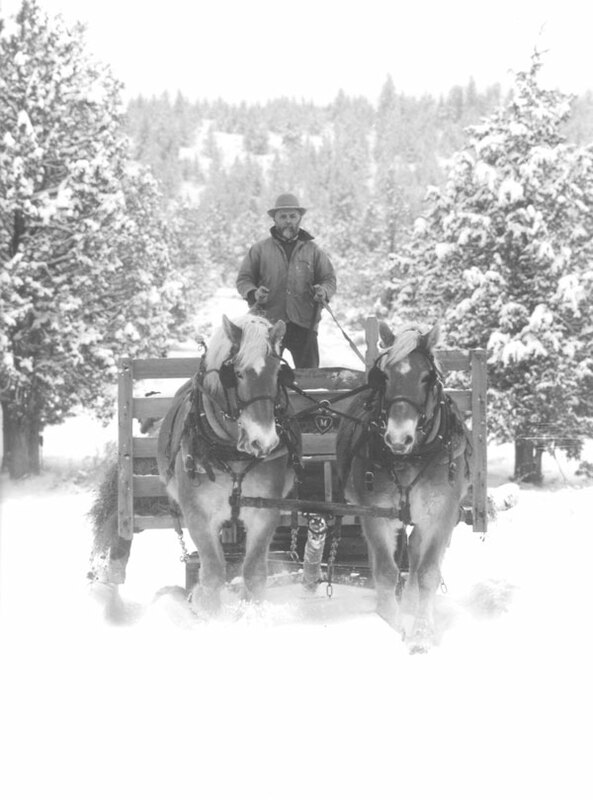 The decision to depend on horses or mules in harness for farm work, logging, or highway work is an important one and should not be taken lightly. Aside from romantic notions of involvement in a picturesque scene, most of the considerations are serious. 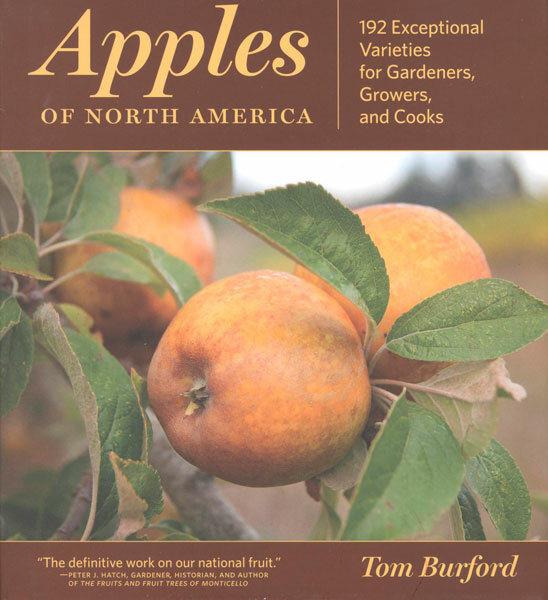 In her new book, Resilient Agriculture: Cultivating Food Systems for a Changing Climate, Laura Lengnick assumes a dispassionate, businesslike tone and sets about exploring the farming strategies of twenty-seven award-winning farmers in six regions of the continental United States. Her approach gets well past denial and business-as-usual, to see what can be done, which strategies are being tried, and how well they are working. 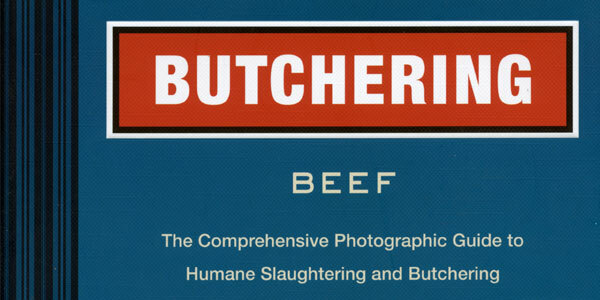 Danforth’s BUTCHERING is an unqualified MASTERPIECE! 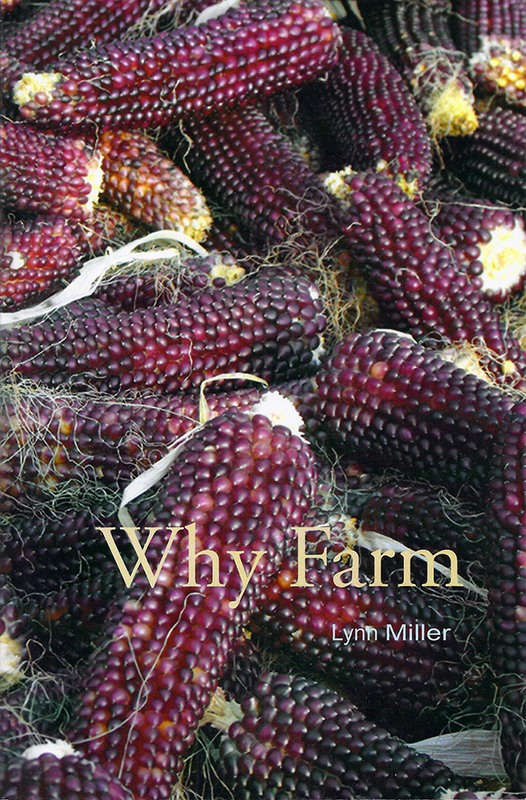 One which actually gives me hope for the furtherance of human kind and the ripening of good farming everywhere because, in no small part, of this young author’s sensitive comprehension of the modern disconnect with food, feeding ourselves, and farming. Horses are honest creatures. 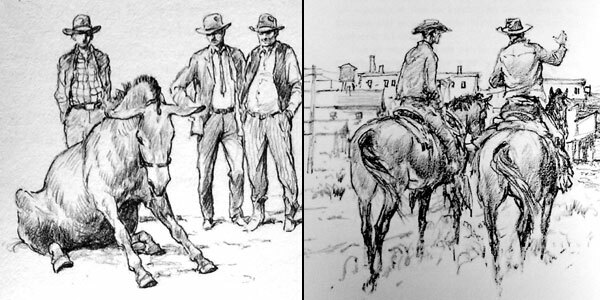 And, what I mean by honest is that a horse is almost always true to his motivations, his needs, his perceptions: if he wants to eat, if he needs water, if he perceives danger. He is incapable of temporarily setting aside or subverting his motivations to get to some distant goal. This is often mistaken as evidence for a lack of intelligence, a conclusion which says more of human nature than equine smarts. 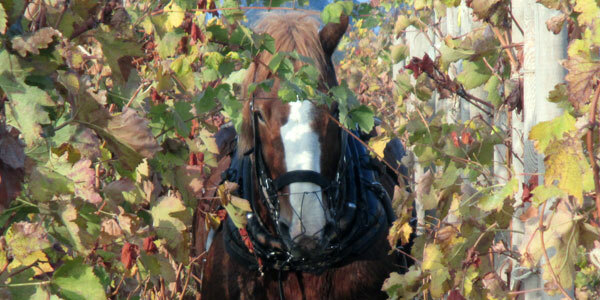 What it means for the horse is that he is almost never lazy, sneaky or deceptive. It is simply not in his nature.